A CENTRAL western Queensland-based technology company is developing a suite of virtual dog fence products to supplement wild dog-proof exclusion fencing projects taking off across the region. Outback Property Solutions’ Virtual Dog Fence and companion products are designed to prevent wild dogs breaching the cluster fence exclusion zones through creek crossings, grids and areas of difficult terrain. The company’s co-founder Keith Gordon, from El Kantara, Longreach said Virtual Dog Fence was a software and hardware product designed to remotely detect and deter wild dogs. The system prevents dogs breaching wild dog exclusion areas where sections are difficult to place a physical fence, such as where the fence crosses a creek channel. In these cases, several Virtual Dog Fence devices can be installed facing the direction the dogs will approach from. 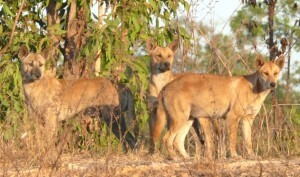 The product’s success draws heavily on the psychology and implicit behaviour of the wild dogs. Virtual Dog Fence has both an active and passive dog deterrent mode, Mr Gordon said. The passive deterrent mode covers a large area around the gap in the fence. The passive deterrent mode is the first line of defence against the dogs. The active deterrent mode occurs when the dog is close enough to the Virtual Dog Fence devices to be positively detected. The VDF devices then immediately produce sound and light to cause the dog to quickly leave the area. In parallel, Outback Property Solutions is developing five additional products designed to integrate with Virtual Dog Fence, and has launched the OPS Communications Network – a solution to allow the various OPS products to communicate with a web-based OPS Portal. ​Until now data communications in the Outback has either been technically impossible or has been cost-prohibitive, the company said. OPS has developed a data communications solution that it says allows the various OPS products to send data back to the Internet. This required solving several technical challenges including the need to operate on solar/battery power, cover long distances with high reliability, and be cost-effective. The OPS Portal is a secure website where property owners log in to see their property and the data collected by the various OPS products (either for wild dog management or other monitoring applications) on the property. Data is continually sent via the OPS Communications Network to the OPS Portal. The OPS Portal will allow a property manager to see the water level in a tank, or whether a particular gate is closed, in real time via the OPS Portal. Gate Guardian ​monitors critical gates and reports when they are opened and closed. The current status of the gate is shown live on the OPS Portal. Turkey Nest Monitor ​provides the current water level within turkey nest dams live within the OPS Portal. Tank Monitor​ provides the current water level within tanks live within the OPS Portal. Mailbox Collect ​reports when mail has been delivered to the mailbox, reducing the number of unnecessary trips to the mailbox. This product is completing development and will be available soon. Chair of the central west’s Remote Area Planning and Development Board, Rob Chandler said RAPAD was proud of the strong working relationship it had built with OPS, not only around cluster fencing but also the work RAPAD was fostering with startups, innovation and technology. “This product is a great combination of how new technology is being applied to help bring back a great traditional industry and it’s being developed not in Silicon Valley but right there on our patch,” Mr Chandler said. More information on Virtual Dog Fence, click here.